Most life survives by utilizing iron. In humans it is an essential component in the function of the liver and kidneys. In bacteria, the creation of protein is essential to their life function. But scientists have discovered that the bacteria that causes Lyme disease does not use iron. The odd little monster instead relies on massive amounts of Manganese. Every other form of life on the planet uses iron for its survival. The immune system of most mammals will starve pathogens of iron to kill them. Borrelia burgdorferi, the bacteria responsible for Lyme disease, has found a way to circumvent this tactic, making it much harder to starve out. The University of Texas reported that Woods Hole Oceanographic Institution (WHOI) figured out why Lyme disease matures so slowly and why it is so difficult to treat. By supplementing Manganese for Iron, the bacteria is not nearly as fast-acting, but becomes more deeply entrenched. When trying to eradicate the disease, medications do not have the added benefit of working alongside of the immune system. The natural immune response is useless. It begins starving the host, but the disease is fine. This is why molecular biologist Valeria Culotta has devoted her research to discovering how to effectively kill the Borrelia burgdorferi bacteria. 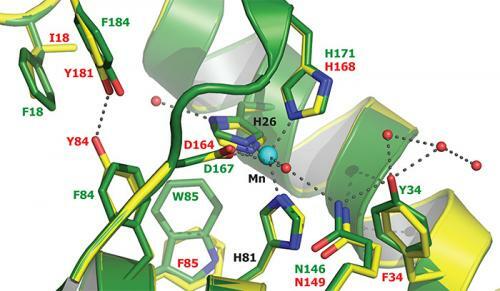 Working alongside marine chemist Mak Saito, she has tried to find out how bacteria are using alternative metals to fulfil the enzymatic binding process that is required to sustain life. Phys reports that in addition to being able to survive iron starvation, Lyme disease bacteria also produce superoxide dismutase. This not only neutralizes the typical superoxides that the body attacks the bacteria with, but uses those superoxides as fuel to become even stronger. Trying to find a way to attack the Borrelia has been a challenge. If detected early, typical antibiotics like pennicilin work well enough by eroding the cell walls. In many types of Lyme disease, this has proven ineffective, as there are no cell walls to attack. “We’d like to find targets inside pathogenic cell that could thwart their growth,” said Culotta.